«Kukryniksy – Soldiers of the Great War. TASS Windows. Political caricature» – exhibition of classic anti-war caricature has opened in the Mamontov’s Gallery. 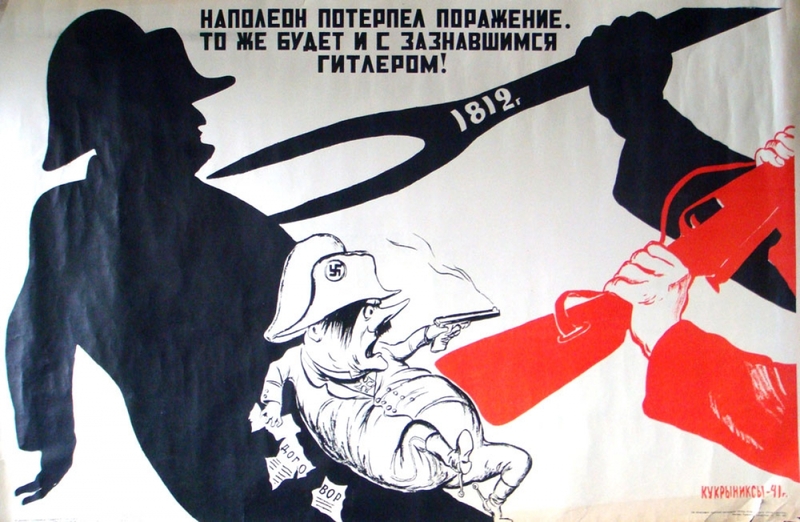 «Mercilessly crush and destroy the enemy!» «Rommel’s March», «Parasite to parasite» – these anti-fascist caricatures by Mikhail Kupriyanov, Porfiry Krylov and Nikolai Sokolov – the Kukryniksy art group, were known to every Soviet citizen as a symbol of resistance to Hitler’s army. The authors of the exhibition in the Mamontov’s Gallery decided to talk about artists, whose works inspired millions of people to military exploits. It turns out that their union was formed in the 1920s. Most of their military works were been created in collaboration with Samuel Marshak. They also worked with Eisenstein, Mayakovsky and Meyerhold – it is not surprising that their living and fantastically memorable pictures have become a real vanguard in the art of war. The exhibition presents caricatures, sketches and drafts that Kukryniksy made in Berlin and Nuremberg, where they were sent to secure the historical process of capitulation and the trial on Nazi war criminals. Many of the works are exhibited for the first time. Private Gallery of Marina and Valery Mamontov is located in a mansion opposite the Tretyakov Gallery. This exhibition space opened in 2007 and is a private collection of paintings by Mikhail Vrubel, Konstantin Korovin, Alexander Bogomazov, Natalia Goncharova, Pyotr Konchalovsky, Alexander Kuprin, Aristarkh Lentulova, Robert Falk. Exhibitions, arranged by the gallery, usually refer to the same period of Russian art. The exhibition will last until July 3.